Go Shuck An Oyster: Are you an Oyster Aficionado? Are you an Oyster Aficionado? 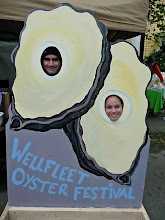 Do you think you have the knowledge to call yourself an Oyster Aficionado? Now you can find out for sure by taking a ten question exam on the Oyster Aficionado website, for free! Before taking the exam you can read the information on the Oyster Aficionado website. The website has multiple modules that range from the history of oysters to the different species around the world. After you learn all of the information you can take the exam and email in your answers. Answer 9 out of 10 questions correctly and you'll receive an Oyster Aficionado Certificate of Achievement, suitable for framing. Go ahead, try to join me in the ranks of Oyster Aficionado!